When you watch Elementary Season 4 Episode 22 online, Sherlock and Joan work with Detective Bell and Captain Gregson to investigate the murder of three people at a diner. One of the victims is none other than Emil Kurtz, the mole in Morland Holmes's company whom Joan had subverted into working for her. Joan immediately suspects that the "robbery gone wrong" aspect of the incident was merely a cover for a targeted hit, with Kurtz as the primary target. She informs Sherlock of her suspicions, and that his father Morland would have motive for killing Kurtz if he discovered that Kurtz was the mole in his company. Sherlock is furious she took such risks with his very dangerous father without telling Sherlock, but what's done is done. Sherlock agrees with her suspicions regarding Morland and focuses the investigation in that direction. But is Morland actually the guilty party, or is there someone else lurking in the shadows, pulling everyone's strings like a puppet master? The plot thickens as they find numerous bugs and hidden cameras in Kurtz's apartment, lending credence to the theory that Morland had discovered Kurtz was the mole. 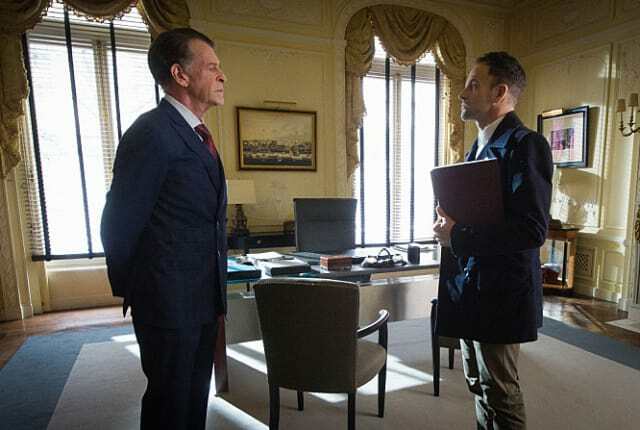 Find out what happens when you watch Elementary Season 4 Episode 22 online! If I'm right, this is not the scene of a triple murder, it's the scene of a double murder and an assassination! 'My dad brokers in global misery' doesn't usually come up. Permalink: 'My dad brokers in global misery' doesn't usually come up.